Featheredge boards can be used to construct a strong boundary fence, repair existing panels or enhance your existing panels. You are able to enhance your panels by using featheredge boards on the reverse side of the fence panel creating a panel containing both ‘good sides’ and an equally pleasant view for both neighbours. We have a range of featheredge boards, all listed below. They are available for fast delivery from our West Midlands depots to popular locations including Birmingham, Sutton Coldfield, Great Barr, Tamworth, Lichfield and more. Feather edge fencing is the most popular type of garden fence panel in the country. Our individual feather edge boards allow you to construct your own feather edge fence panels exactly how you want them. This is ideal if you require a certain size that can’t be bought and has to be made to measure. 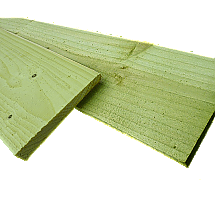 As well as allowing you to construct your own panels, feather edge boards allow you to fix any damaged boards within your existing fencing without having to replace the entire panel. All of our boards are manufactured to the highest quality to offer strong fencing that will stand the test of time. To find out more about our products, delivery details or for more information about us, please contact us today.